Get some real hooters! The Twin Supertone horns include both a single 500hz high tone and a single 300 hz low tone horn which together produce a sound level of 118 Db. The horns will mount on the factory original BMC or Triumph brackets in locations. Fantastic sound, everyone will get out of your way when you toot. Horn kit includes a relay and instructions. This is a Morris Crested leather gear shift knob. Fits all Morris (Minors and Minis). You’re not going to throw any random knob in your Morris. 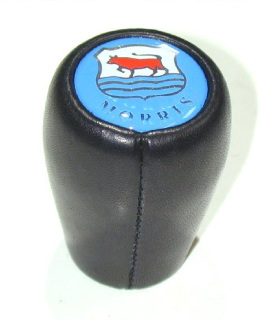 This knob will be a natural fit for you and is made of elegant black leather with a medallion displaying the Morris logo .The shift knob is designed with a hard plastic insert that accommodates a range of shift lever sizes and thread widths. Prior to installing the shift knob, screwing on a jam nut is recommended. 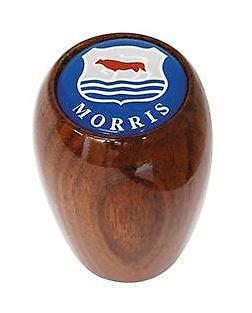 This is a Morris Crested Wood gear shift knob. Fits all Morris. You’re not going to throw any random knob in your Morris. This knob will be a natural fit for you and is made of elegant rich walnut with a medallion displaying the Morris logo .The shift knob is designed with a hard plastic insert that accommodates a range of shift lever sizes and thread widths. Prior to installing the shift knob, screwing on a jam nut is recommended.